Living in the hustle and bustle of life, have you ever wondered about who you really are? If you are active on social media, behind that blog, Facebook or Instagram account, is that the real you that you are portraying? I think life is a continuous journey of self-definition but more often than not, in the quest to make ends meet and being preoccupied with our mundane routine, many of us end up getting lost in the crowd and forgetting who we truly are. I know that. Because I've lost a part of myself too, a part that I'm trying to rediscover and reconnect. You see, ever since I became a mum, the kids have become my utmost priority. That is not a bad thing and I must say it comes naturally to any parent, right? So I dedicated my 24 hours a day to them and considering that it was hands-on, sometimes solo, parenting right from the moment I gave birth in Sweden, I soon got used to the notion of taking care of a house on my own and spending time day in and day out with the kids. Sure, most people would swear by the importance of we-time and me-time after marriage and even though we were in a foreign land, the hubby and I would try to watch some movies or drama series together on the TV or take turns to hang out with friends. He would usually choose some ancient chinese drama like 射雕英雄传 or Jack Neo titles while I would go for Taiwanese idol dramas like 海派甜心 or a love comedy. Just to be fair, we would take turns to choose. Since we came back to Singapore, it seemed like there weren't enough time or opportunities to get in touch with the friends and family whom we had missed out on during our time overseas. Plus, it seemed like with a second child, our we-time seemed to vanish and we were losing the spark as a couple. Remember I said it was a bad time for us last month and I tried hard to find that silver lining? It took us a lot but I think through hurtful words, quarrels and lies, it finally dawned on us that we needed to have more heart to heart conversations and make effort to reignite that once burning flame. I think one of my best friends put it in a very concise manner, that other than our kids, we have to remember that we have another "baby" to look after and that is the spouse. It is just too easy to take each other for granted, especially once the kids come along, and that will only trigger a vicious cycle where we end up feeling unjust, unappreciated and unloved. So we read up books on the five languages of love, we tried to empathise with each other more, we make efforts to reconnect as mature individuals, we held hands when we were out, we reminded ourselves that life didn't have to revolve around the kids alone. You have to know that this is a big step for me because for the first time in my life, I am learning to let go as a mum and remind myself that I still have a life. Not just a mum, I am also a wife, a friend, a blogger, a daughter and a woman. Today, "Happiness is.." is all about rediscovering myself. Yes, I'm still showcasing all the fun things we did with the kids because family is still my priority, but you can tell, you can surely tell that in between loving and caring for them, I am trying to rekindle a romance and finding back my true self. The kids went on the Zoomoov rides! At $10 for three rides of 5-mins each, I don't think we would be doing this every time but it sure was good fun while it lasted. Oh, just so you know, parents are allowed to accompany their child so yes, I did it with Ariel and it was quite a memorable experience riding with her on a bear in the mall with all eyes on us. One day, we were out and as usual, had no plans of where to go. The hubby gave me three choices - Changi Village, East Coast Park or Changi Airport. We chose to head to the airport where we had a yummy dinner at Saboten which serves one of the best tonkatsu in Singapore, fascinated ourselves by watching the Kinetic Rain for the first time, and let the kids go wild at the free playground in Terminal 1. That was certainly one fulfilling evening. Back at home, I was cooking one of our favourite dishes of all time - Mee Hoon Kuey. I don't know how I suddenly got the inspiration but I remembered I had plenty of bento making tools lying in the kitchen, so we decided to have a one-of-a-kind Mee Hoon Kuey made up of Hello Kitties, My Melody, bears and penguins. September marks my dad's birthday and so we had a celebration for him at House of Seafood. When it came to the cake cutting ceremony, well, he had two very enthusiastic helpers who were more than happy to sing the birthday song over and over again just so they could blow out the candles. We also went to the River Safari again! This time round, we brought the parents-in-law who visited the place for the first time and it was cool that we could show them the way around. Did you know? It only costs S$12 per ticket for a senior citizen to enter! I think I need to bring my parents here soon too so that they have at least been there and done that. One morning, I don't know what hit me but I decided to cook a fishhead soup and went to the supermarket to buy more seafood so that we could have a steamboat buffet in the house. For the first time, I bought flower crabs and wanted to surprise the hubby. It turned out that I discovered our steamboat was lent out and not one to give up, I went around asking the neighbours for help and ended up we not only had a steamboat, we also had a grill session complete with yummy butter crabs. Smoke, grease, smells and oily floors, I think I can deal with those every once in a while. I must say we visited many new places this month (I will be sharing more on each in subsequent posts) and one of it is Play@NMS. The girls were really delighted with their new finds, especially the giant chalkboard, and you know what is the best thing about this place? It's free! Next, we also visited the Animal Resort at Seletar Farmway, a place I had been wanting to go for the longest time. Don't ask me why we did not although it is so conveniently located near our place. Anyway, it was awesome for the kids to be able to come up close with geese, peacocks, horse, chickens, cassowary, rabbits, guinea pigs and fishes! And talking about a small world, we realised that the old lady here used to be a good friend of the hubby's granny and even knows almost the entire family. This month, we were lucky to receive our first jewellery sponsorship from Centime Gift and while I love the stackable name rings with the kids' names, I also feel blessed to own a personalised and unique necklace that solely belongs to me and reminds me to always stay happy. Just so it is probably high time to start pampering myself just a little more, we were in Batam for a quick, last minute getaway and I decided to sneak out one morning for an one-hour massage session. Believe it or not, the last one I had was close to a decade ago. And no, I don't go for facials or mani-pedis. For that one hour, I allowed myself to indulge, relax and unwind. I now realise how important it is for every mum to find ways and means to recharge and reinvigorate, not just working mums but also stay-at-home mums who face the kids 24/7, so that we have renewed energy and strength to face the daily challenges of motherhood. Be it a quiet shower, a stroll in the park or a heavenly half an hour of blogging in peace, little things go a long way. Likewise, the hubby would take time off to be with his friends, watch a football match, grab a coffee or read his newspapers in peace. As long as we learn to understand, communicate, be considerate and be honest as husband and wife, I think we are slowly but surely working out the kinks and getting to the place where we feel totally at ease and happy just growing old with each other. Oh, and we did something fun as a couple in Batam too! Did you know that I am very much into shooting games? Well, for less than S$15, we fired 50 shots and got such a kick out of it. While Angel was happy doing her colouring in the Kids Club just a few steps away, Ariel insisted on following us and the kind babysitter sat with her outside the glass door watching us. For that ten minutes, it did feel like the hubby and I were transported back to our courtship times and that felt pretty awesome, I must say. For the first time since we became parents, we also went to catch a movie as a couple. It was a midnight show and we went out only after making sure the kids were fast asleep. You know, even though his parents do stay with us, this was the first time we sneaked out on our own for a movie and requested for them to keep a ear out for any crying. Luckily, we came back shortly after the show and a quick supper (can you believe I ate a whole bowl of laksa and some roti prata at 2am? ), and the kids never woke or kicked up any fuss. Even though the show - The Prince by Bruce Willis, Jason Patric, John Cusack and Rain was a tad disappointing, I think what mattered was the company and the feeling that we are regaining back the spark and romance, don't you think so? There, once again I have poured out all my innermost thoughts and shared with you about my happenings for this month. I think it is really crucial to remember that no matter how old we grow, even if we are lucky to become great grandmothers, we must never hide behind a mask, forget who we are and end up losing our true selves. How was September like for you? 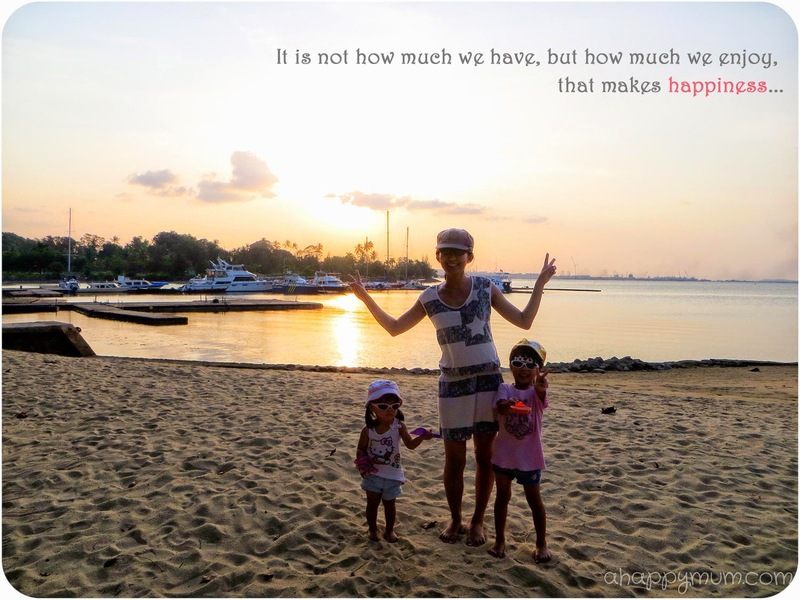 Love your 'Happiness is' posts...Reading your September update brought a smile to my hectic day. It's good to recap the month by counting our blessings. Thanks for the inspiration! I know, Susan, it took me a long time to realise that but I know better now. Oh yeah, things are picking up and I'm back in the happy mode once more, *phew*! Thanks so much for reading and like I said before, I will never understand how working mums like you can do it so well, but then again, you are the juggling mom and you are doing such a great job at handling everything! Oh yeah, thanks for your advice too, babe, I really appreciate it! =) Nice to have a friend by me for the past nearly 20 years and more decades to come! Glad we have each other! Thanks Dom! Yes, a little time out makes a big difference and a slight change in mindset was all I needed to get things right on track again. Thanks so much for reading and for linking up once again! Thanks for this post, Summer. It's so real and raw and heartfelt! I agree with you that it's so easy to lose yourself. Sometimes I wonder too, if behind all those happy faces we see in IG, how many are really happy all the time? and I applaud you for coming out to say it out loud! Good to see that you're taking steps in the direction to rediscover yourself. Thanks girl! Yeah sometimes I wonder too about the story behind every happy face. I guess everyone has their woes in one way or another. I did wonder if this post was too overly heartfelt and raw, but oh well, I guess that's how it has been on the blog and wearing my heart on my sleeve somehow helps to make me more vulnerable yet stronger at the same time. Thanks for reading! Laksa and prata at 2am is so awesome! The last time i did this was pre-kids days. Thanks for this timely reminder, Summer. It's too easy to be sucked into our motherly duties everyday that we often forget we need to connect with ourselves and our spouses too. Haha oh yeah, supper in the wee hours was the in thing for us too before the kids came along and sleep became more important. =) You should do it again with the hubs! =) Yes, too easily sucked into the never ending chores, I definitely agree and think we need to take a step back at times and see the bigger picture. Thanks much for reading! I can totally empathize with you. It's important to have time for ourselves and spouses. Since we are overseas and have zilch support system, for a long time it was all work, household chores, caring for the kid...We finally realized the need to decompress and spent time to nurture ourselves/relationship (meaning we paid for babysitter so we can finally go on date nights!). It was pricey, but money well spent!. Binny!! So nice to hear from you! Oh man, how are you doing there and how's the little one doing? =) We should meet up when you next come back for a visit! Anyway, yesh, zilch support system overseas is right and I think we both know how the chores never seem to end especially once the kid comes along. It's so awesome you manage to get a babysitter so you can go on dates! You know, back in Karlskrona, jw was a little appalled when he sees that his colleague leaves his kids with another colleague just so he and his wife can go on couple dates. It wasn't a notion we were used to and somehow we just took up the responsibility of looking after our kids 24/7. I think it took us a long time to realise the strain it was causing to our relationship but hopefully it's better late than never for us to make up for some seriously deprived couple time. I am glad things are going well for ya over there!! =) Stay in touch yeah! Aww Wenqi, thanks so much for reading and for your kind comment! I never did have friends who advised me on that but I think at that point even if they did, I wouldn't have listened anyway. Haha. I was just too engrossed and thought I was perfectly happy being with the kids 24/7, especially since I did it for years in Sweden. I now know the importance of date nights and keeping the spark alive! Took me long but at least I am here now and seeing the bigger picture in life. Thanks for the encouragement!